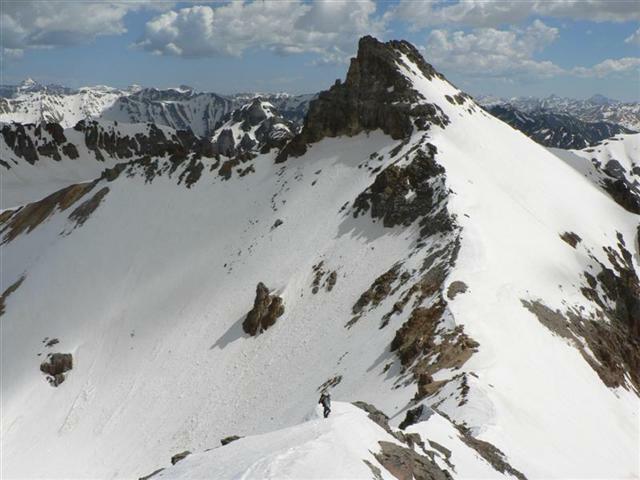 After climbing American Peak, Jones Mountain and Niagara Peak the following day and finding very favorable snow climbing conditions, we were excited for another potentially great couloir climb-the Vermillion Dollar couloir on Vermillion Peak. Saturday evening we settled into a nice, free campsite at one of three designated camp areas along the South Mineral Creek road just outside of Silverton. We awoke at 5:00am and went through the same ritual we had the previous day-toasted green chile bagels with cream cheese and coffee/tea along with some orange juice. We packed up the campsite and drove the short distance up the road to the official South Mineral Creek trailhead at 9,820' right next to the $16.00/night South Mineral campground. Why anyone would pay $16.00/night for a campsite when great, free camping is just down the road is beyond us. Like the road up to Grouse Gulch, a 2wd car can easily drive this road to the trailhead. 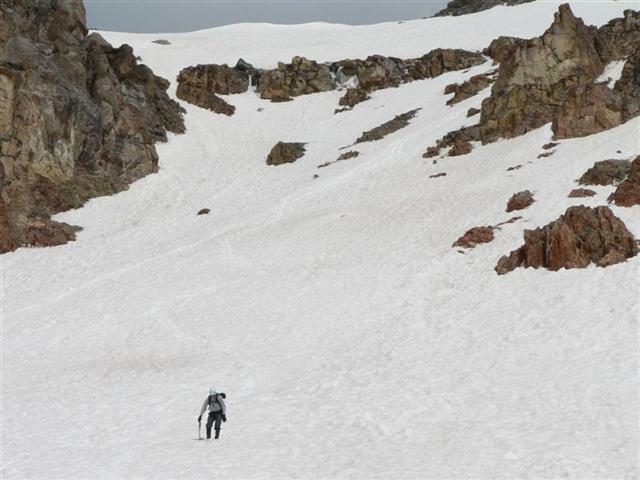 We started hiking up the well-signed trail at 6:05am while trying to discern the trail known as the KT traverse that is used during the Hardrock 100 run that connects the upper section of Porcupine Creek to Ice Lake Basin. The air was cool but the sky completely clear with a promise of being another perfect day. Once up into the lower Ice Lake Basin the trail turned to snowpack but we were able to stay on top for the most part and kicked good steps on the steeper sections before reaching Ice Lake. Our first view of Fuller Peak, Vermillion Peak and Golden Horn from lower Ice Lake Basin. We continued up a slight ridge to a spot where we could clearly see Fuller Peak, Vermillion Peak and Golden Horn. The basin was chock-full of snow and looked amazing. Only a few rocks here and there protruded from the snow to break up the sea of white. In the basin we warmed up very quickly because the air was still and the sun was reflecting from all sides. We picked a line straight across the basin and up the steep snow wall to a bench just below the start of the Vermillion Dollar Couloir. Making our way straight at the Vermillion Dollar couloir seen near the top of the photo above Bill's right shoulder. The snow was soft enough that we did not need crampons but the security of an ice ax in hand was nice. Looking up the Vermillion Dollar couloir we could see ski tracks coming down and wished we had brought our snowboards suspecting that line would be a super fun one despite it being relatively short. Some scattered rocks at the base of the wide couloir helped us decide it was a good idea to wear the helmets we had carried and then, at 9:10am, we were started up the couloir. The snow in the couloir was still soft enough that crampons weren't necessary and we picked a line straight up and to the left of a large boulder in the middle of the lower couloir. Passing this couloir was the crux of the route as we feared we'd posthole through the warm snow. 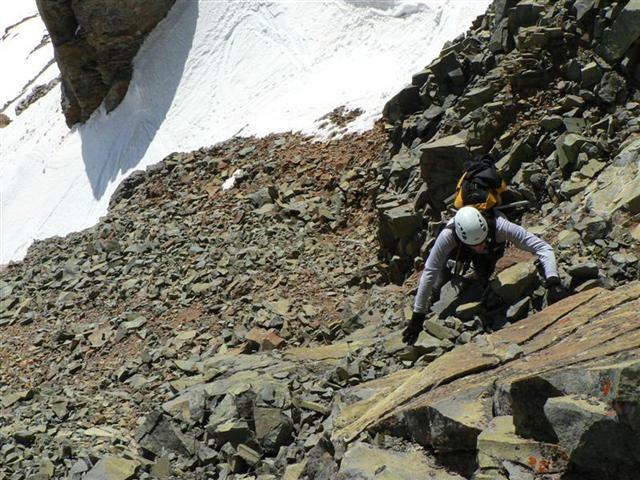 But it went fine and soon enough we were enjoying more great, straight up climbing in the upper couloir. I found one set of previous steps and made good use of those to the top. Nearing the top of the Vermillion Dollar couloir. At the top of the couloir we exited right onto well-worn but loose rock to finish the scramble to the summit. This loose rock was pretty sketchy and certainly grabbed our attention and had us yearning for more of the great snow we had just finished climbing. Loose rock after exiting the couloir just below the summit. We reached the summit of Vermillion Peak at 9:40am to take in the fabulous views of Ice Lake Basin to the east and the Wilson group of peaks to the west. The difference between the two sides was like night and day. The west side of Vermillion was dry and green while the east side was all white and blanketed in snow. Quite the contrast! We signed the summit register noting that we were the fourth party of 2007 to sign it and then headed down the northeast ridge towards Golden Horn. Heading down the northeast ridge of Vermillion towards Golden Horn. 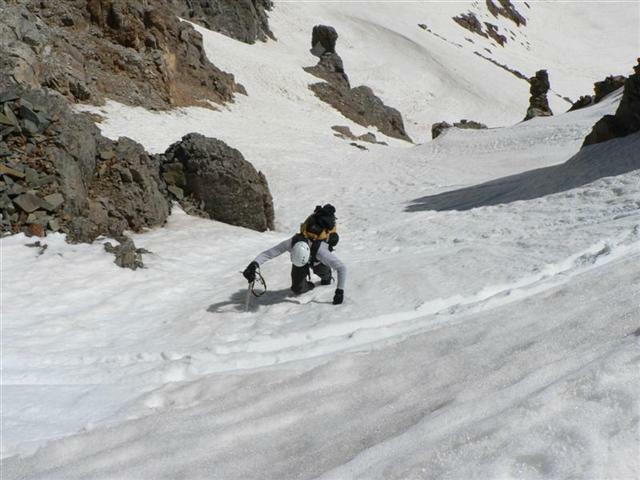 Some decent route-finding and a short bit of down-climbing was necessary on the ridge descent to Golden Horn but it went pretty quickly and we soon found ourselves kicking steps up the snow to the summit of Golden Horn. On the summit of Golden Horn at 10:55am we found a curious summit decoration-a torn and deflated "Love Ewe" inflatable adult novelty sheep. Very curious indeed. With my gloved hands I cautiously rolled up the plastic sheep trash and put it in my pack to carry out and dispose of at the first dumpster we found. We then noticed a couple of hikers in the basin to the north of Golden Horn and wondered what they were up to as they headed west. 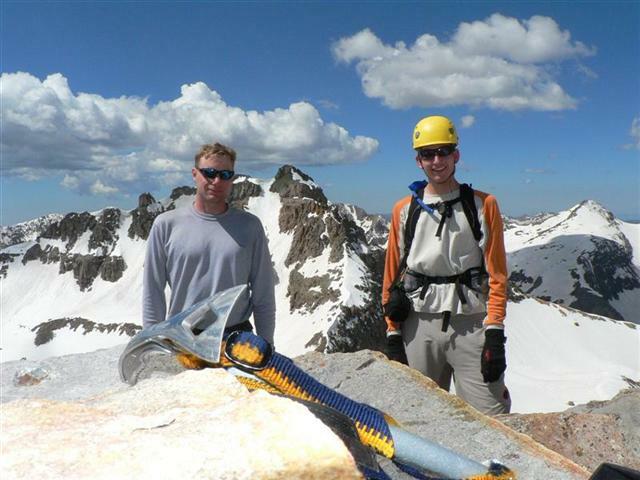 On the summit of Golden Horn with the Vermillion Dollar couloir between us. Then the fun began! The boot skiing down the south face of Golden Horn was nearly as good as the boot skiing we had enjoyed yesterday down Niagara Peak. 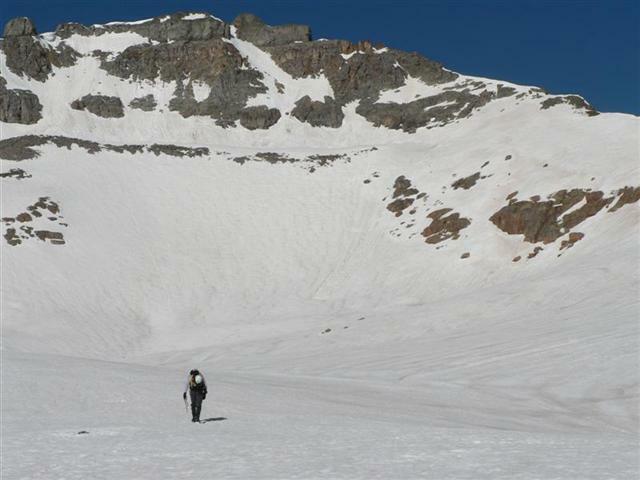 We descended 700 feet down into Ice Lake Basin in 8 minutes! Good stuff! More awesome boot skiing turns down the south face of Golden Horn. We opted to stay on snow more than we had on the way up and passed by Fuller Lake and an old building near the lake before taking a direct line down the snow to lower Ice Lake Basin with minimal post-holing. Once we reached dry trail it was an efficient jaunt back down to the trailhead by 12:45pm. 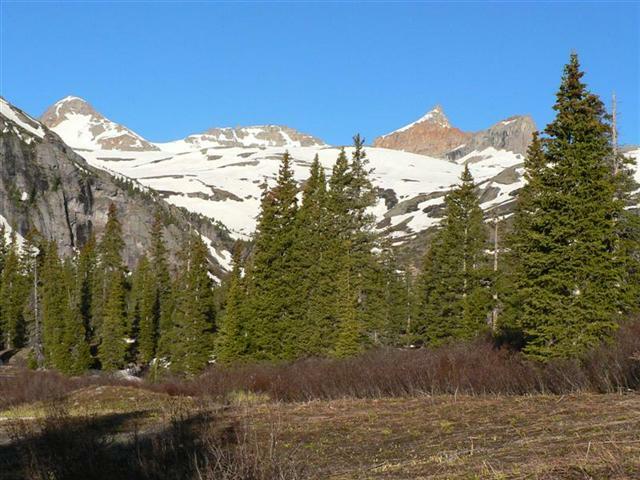 Written by Jason Halladay on 12 June 2007 for TheMountainInstitute.com.